Updated for March 2019. An artificial transmission line is made up of lumped inductors and capacitors. You might know that any transmission line can be modelled with lumped elements, here we actually try to construct it that way (often to save space). In practice, the perfect capacitors and inductors you start out the design with will have parasitic elements that you must consider which add some limitations. What is an every-day example of an artificial transmission line? Check out the input network in a distributed amplifier. Why would you want to create an artificial transmission line? One reason is that you could shrink physical length of the line, like in slow-wave structures. The first known (to us) mention of artificial T-lines was by Mihajlo (Michael) Idvorski Pupin, the Serbian/American inventor. His US patent 519,346 of 1884 on an Apparatus for Telephonic or Telegraphic Transmission discusses how he used periodically-placed coils to speed up a telegraph line, effectively creating a controlled impedance line with a cutoff at audio frequency. The driving force behind this work was to figure out a way to speed up transmission along a transatlantic cable (first successful connection 1866), which originally could muster just half of a single letter of Morse code per minute. At the time, his technique became known as "Pupinizing". Pupin wrote an autobiography, From Immigrant to Inventor, which has been republished. Here is an IEEE article which puts Pupin's work in historical perspective. Pupin's work leveraged earlier work by Oliver Heaviside, who came up with the idea of the Telegrapher's Equations on which transmission line theory is based (and correctly theorized that adding inductance to long lines would solve transmission line problems). Pupin profited well from his 24 US patents, while Heaviside was chronically poor. Early in the twentieth century, the transatlantic cable reached speeds of 120 words per minute, thanks to Pupin and Heaviside. There are surely many other artificial T-line investigators along the years, but Frenchman Leon Brillouin's Wave Propagation in Periodic Structures (1946) pretty much beat the topic to death. Below we used Microwave Office to construct an artificial transmission line with near fifty-ohm impedance. We cheated and looked up the inductance and capacitance per meter of RG58U cable on Belden's web site. They provide data per foot at 28.5 pF/ft and 0.0801uH/ft. If you plugged in the lumped element values for a full foot, the t-line would not work at microwave frequencies, so we conerted to inductance and capacitance per millimeter. Then we strung up 16 sections and analyzed it. In case you can't read the text, the inductors are 0.263 nH and the capacitors are 0.094 pF. Note that RG58U is nominally 52 ohms. While we're on the subject of nano-henries, the state of New Hampshire has the same abbreviation. How you will profit from this piece of information is not obvious, but see what you can work out. Note that if you wanted to create an artificial transmission line with loss, you can add series resistors. In practice, inductors and capacitors will have losses associated with thier quality factors (Q). And lall umped elements has other parasitics that cause self-resonances and other issues. How "long" is an artificial transmission line? It's physical length will be a function of how you implement the lumped components, so it is better to talk about how much delay (propagation time) it has. In our example, sixteen sections that behave like 1mm each means that our T-line should act like 16 mm long of RG58U. Let's call that its equivalent length. The velocity factor of RG58U is 66%; with the speed of light roughly 300 mm/ns, the velocity of propagation along our artificial line should be ~198mm/ns. The propagation time through the line should be about 0.080 ns, or 80 ps (16mm divided by 200mm/ns). 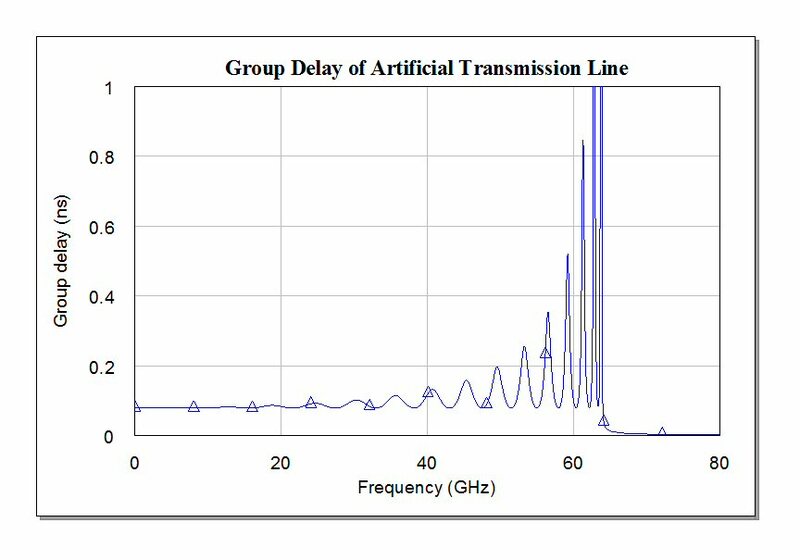 Let's see how artificial transmission line behaves. Below are the magnitudes of S11 and S21. At low frequency, the line is well matched to 50 ohms, but the return loss humps steadily increase over frequency. The dip in S11 at 6.36 GHz indicates that the line is a half-wavelength at this frequency. At 6.36 GHz, the period of the wave is 156 picoseconds (T=1/f, remember?) Our line is 80 ps long, we have agreement that this is the half-wave frequency. Similar dips occur where the wave is 2/2, 3/2, 4/2... waves long. At ~64 GHz in this example, an interesting thing happens: the structure ceases to function as a transmission line. This is called the Bragg frequency. At this point, the line's characteristic impedance goes to zero; hopefully we'll show you that calculation one of these days. In 1915, William Henry Bragg and William Lawrence Bragg developed the science of crystallography using X-ray diffraction. This father-and-son team is who we refer to when we talk of Bragg frequencies. Meet them in our Microwaves101 Hall of Fame! Before we get into this topic, please feel free to waste some of your employer's valuable time watching the Commander McBragg cartoon below. Most of you have already worked for someone just like McBragg, or maybe you are related to him. What a jerk! where L and C are the values of the individual segments. Sorry, we don't offer proof of the FBragg formula, but you can find it in various publications. One of these days we'll add some references to this page. Delay=SQRT(LC). If L and C and in nH and nF, delay will be in nanoseconds. Without lifting a pencil, you can see that delay at FBragg will be pi/FBragg. How do you calculate the phase through a segment at a particular frequency? Divide the time delay of the segment by the period of the frequency and multiply by 360 degrees. At FBragg, the phase of a single segment is 360/pi, or 114.59 degrees. That's a Fun Fact, but also completely useless: A single secton of the line might show 114.59 degrees of phase, but if you cascade ten of them, transmission phase is immaterial as you can't pass a signal down the line at FBragg! This previous rule of thumb was slightly off, but not a bad approximation! In the above structure, each cell contributes about 5 ps (1/16th of 80 ps). The period of a signal at 64 GHz is approximately 15 ps. The Bragg frequency of an artificial transmission line occurs where the unit cell is apprximately 1/3 of a wavelength. More accurately, it occurs when the unit cell has tranmission phase of 360/pi degrees. Looking at the unwrapped phase angle of S21 confirms the half-wave points (180, 360, 540.... degrees). The line eventually starts to curve, which is an indication that it is less than ideal. At the Bragg frequency the structure's transmission properties disappear. Now let's look at the group delay. Here we see that the predicted 80 ps of delay is achieved. At the Bragg frequency, the line stops working and the delay heads toward zero. If you stay below 20 GHz, the line behaves well. 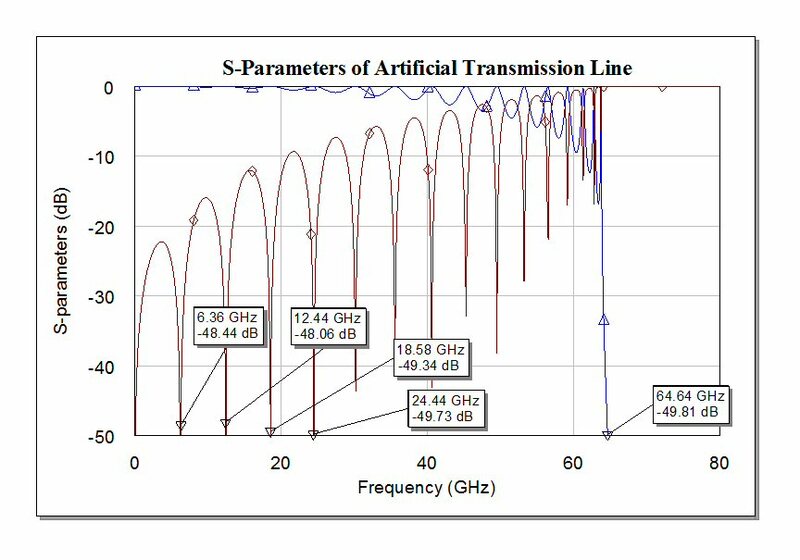 In conclusion, the ideal artificial transmission line behaves pretty well, at perhaps up to 1/2 the Bragg frequency, but it loses it impedance match starting all the way down at "DC". We were able to duplicate the propagation constant and impedance of the RG59U cable by sectioning it at 1mm intervals. The loss of such a structure will be a function of the losses of the constituent components, i.e. the Q's of the inductors and capacitors.